Sheffield Night Strider – the night-time charity challenge in aid of St Luke’s Hospice – makes its return on 7th October for its third year. 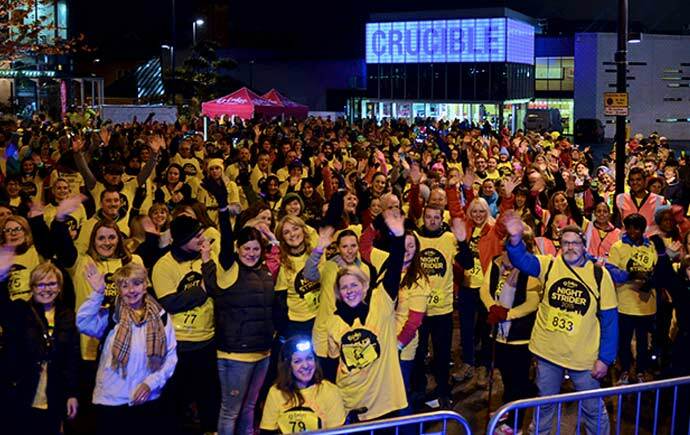 Last year the event saw more than 1,000 participants take to the streets to take part in the nocturnal half marathon or 10k walk, and next month Night Strider aims to raise more than £130,000 for patient care at St Luke’s Sheffield-based hospice. Starting in the city centre at Tudor Square and heading out towards Ecclesall, the challenge is a great opportunity to enjoy some of Sheffield’s finest views by moonlight. With no running involved, the event is open and accessible to a wide range of ages and abilities (though participants aged 10 to 17 must be registered and accompanied by another participant aged 18 or over). Wheelchair users are encouraged to take part in Night Strider, but due to the nature of the route and distance it is advisable they should source suitable assistance for the challenge. The individual entry fee is £25 and places are limited… so get signed up on the website ASAP!